Traditional Chinese Medicine and Acupuncture services offered by Morgan Vargo, D.V.M. - Thank you for your interest. Please contact our office directly at 813-677-3100 for more information. Veterinary Acupuncture is a relatively new and rapidly growing field in the United States, but has been around for several thousand years in countries such as China. Acupuncture involves the use of very thin needles inserted into specific points around the body to cause a healing effect to happen in the body. It is a very safe treatment option, with the only potentially negative side effect being the (sometimes) unpleasant feeling from needle insertion. Although Acupuncture and Chinese Herbal medicine were traditionally used as sole treatment options for thousands of years, integrative medicine combining Acupuncture/Traditional Chinese Medicine with current diagnostics and treatment options can offer the best of both worlds, leading to a more complete and effective treatment for your pet with the fewest side effects possible. Based on Traditional Chinese Theory, sickness and pain are caused by imbalances in the Qi (life energy) or other forces at work in the body. Acupuncture and Traditional Chinese Medicine attempt to correct these imbalances by placing needles along specific meridians or in certain points. In Western/Scientific terms, acupuncture causes changes in the body by stimulating nerves at specific locations, stimulating local circulation, controlling muscle spasms, and causing the body to release natural hormones (like endorphins or cortisol) to help treat conditions. There have been many well done scientific studies done about acupuncture in humans and animals, including MRI brain mapping to determine exact effects of specific points, although there is much research left to do! In China, Acupuncturists are used to treat all types of illnesses, and in theory the same can be said for pets. However, some conditions do respond better to acupuncture than others. Conditions for which we expect the best response include chronic pain, acute pain, neurologic conditions such as paralysis or disc disease, acute or non-healing wounds, non-infectious inflammation including allergies, diarrhea, sports medicine and reproductive disorders. Acupuncture can also be helpful in addition to conventional treatments for cancer treatments or chronic disease management. What Happens at a Typical Acupuncture Session? At most acupuncture sessions, the doctor or technician will first ask you a long series of questions. Some of these questions will be typical of any vet visit (reason for visit, eating and drinking habits, etc), while other questions may seem unusual (favorite sleeping places, times of day when problems happen, seeming hot or cold all the time). These questions help establish a specific diagnosis for your pet based on Traditional Chinese Medicine. This diagnosis will help your veterinary acupuncturist select the best treatment for your pet. After the initial history, the veterinarian will do a comprehensive exam on your pet. This may have been done previously but will need to be repeated. Sometimes, your veterinarian may recommend additional diagnostics to further help diagnose your pet. Based on the exam and history findings, the veterinarian will select acupuncture points to be placed on your pet. This involves the insertion of very thin needles into very specific points on your petâ? ?s body to help enact a healing change in your pet. For the average acupuncture treatment, 10-25 needles are typically inserted, although some pets will only tolerate fewer needles, especially older pets or cats. The number of needles does not necessarily affect the outcome of treatment. Depending on the condition being treated, your veterinarian may choose to add other acupuncture techniques, such as electroacupuncture (stimulating certain points with electricity), Aqua-acupuncture (injecting medication at certain points) or hemoacupuncture (withdrawing small amounts of blood from specific points). Needles are typically left in place for anywhere from 10-30 minutes, depending on the condition being treated. After acupuncture sessions, your veterinarian may give you take-home instructions about changing diet, massaging certain areas, or specific medications to give to help enhance the effect of the acupuncture session. Many dogs are somewhat sleepy for a few hours after the session, while other dogs experience increased energy. Occasionally, the condition being treated can appear to worsen for up to 48 hours after the session before showing improvement. This is usually a good sign and most animals have a great response after the first few days! 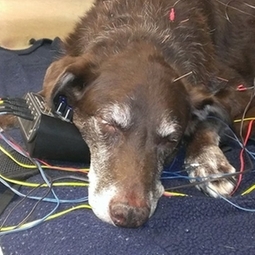 Most animals tolerate acupuncture very well, and many even enjoy it. Acupuncture needles are much smaller and sharper than the needles used in procedures like vaccination or blood drawing, so the amount of discomfort is significantly less. That being said, the needles do cause specific reactions to happen in the body, which may include local inflammation or increased blood flow, so some unusual or uncomfortable feelings can happen. Most of the time we consider this a good sign, as it is an indication that the needles are having their desired effect. For most animals, the most uncomfortable part of the treatment is the initial needle insertion, after which they do not pay much attention to the needles. In fact, many animals experience a calming or sedating effect from the needles and may choose to take a nap. How Long/How Many Treatments Will my Animal Need? Most acupuncture sessions last from 30-60 minutes, depending on the condition being treated and the animalâ? ?s response to the acupuncture. How many sessions will be needed is very dependent on the problem being treated. For problems that just occured (strains/sprains/diarrhea/vomiting/back injuries) and have not been going on for a long time, sometimes 1-2 treatments within a week or two can be enough to cure the problem. For more chronic problems such as arthritis, pets usually need 1-2 treatments per week for 3-5 weeks. Chronic problems usually show some response by 3 treatments, and a maximum response by 3-6 treatments. Once a maximum response is achieved, treatments can be slowly tapered down to being done only as frequently as needed for symptomatic control. For many pets this can be as little as monthly to every 3-4 months. If acupuncture cannot be done at least weekly for 3 weeks for chronic problems, it is still possible to enact a change in your pet. However, it may take longer to see the positive result from the treatment. What About Traditional Chinese Herbal Medicine? In China, Acupuncturists work hand-in-hand with herbalists to treat medical conditions. Herbal medicines are plant-based medicines that work in ways similar to our western medicines to enact a change. So long as obtained from a trusted pharmacy, herbal medicines are safe and can be effective ways to manage your petâ? ?s conditions alone or along with acupuncture. Since they are plant based and balanced formulas, patients typically experience fewer side effects than can be present with typical medications, with the most common side effect across the board being diarrhea. Herbal medicine can be helpful in extending the amount of time between acupuncture treatments, although most pets can still have a positive response from their acupuncture treatments alone without using herbal medicines.